Tim Duncan’s retirement yesterday was no surprise, at least to me. After watching that second round playoff series against the Thunder, I thought there was no way he was coming back. It seemed like the Spurs knew that when they signed Pau Gasol to a two year, $30 million contract. He just looked really broken down. It wasn’t the productive Tim Duncan anymore. One of the most amazing things about Duncan is not that he survived 19 seasons in the NBA, but for all 19 of those he was productive. He never wore down. Sure, the regular season rest throughout his career played a big part of that, but to be reliable as he was for that long is unheard of. Duncan definitely had a prime, but was never unproductive, like Kobe Bryant was his final two seasons. Duncan retired when he knew he was done. He knew next year would not go well for him. He was smart, unlike Kobe. He did what so many guys don’t do: Retire at the right time. But the reason I paired Kobe and Duncan together in one column isn’t totally because they retired at the same time, but because they were two of the three best players of this generation of basketball. My generation of basketball (Thanks to Reddit for identifying the generation. I agree with the time frame). The best player of my generation is LeBron James, who has now made his way into the top five all-time. But Duncan and Kobe are both top twelve. 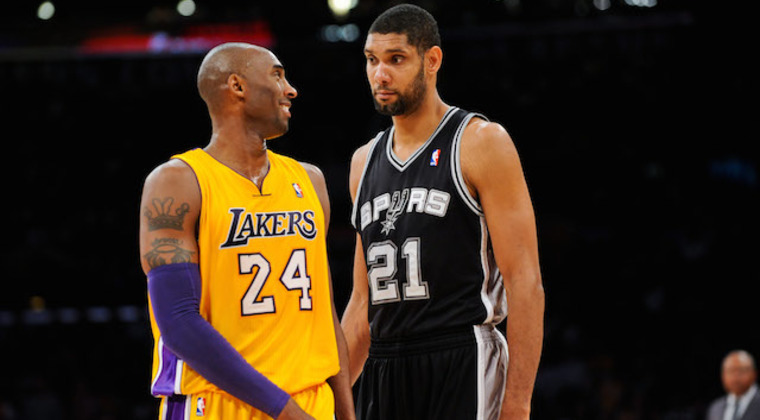 Via my top 25 GOATs list, Kobe is 9th and Duncan is 12th. Thats a pretty impressive generation. I’ve grown up with some great players. One of my points here is that its sad and a little ironic to have these legends retire in the same offseason. But the positive is that they aren’t gonna hurt themselves anymore. It would have been heartbreaking and legacy-hurting to have Duncan play again. Kobe already hurt himself enough with these two extra seasons. Him playing one more wouldn’t have been surprising, and probably not legacy-altering since we all know Kobe is ignorant that way, and always has been. While Kobe and Timmy are both all-time GOATS and are two of the three best players of this generation, they both have also had quite the emotional impact on me, and thats meant in a negative connotation. 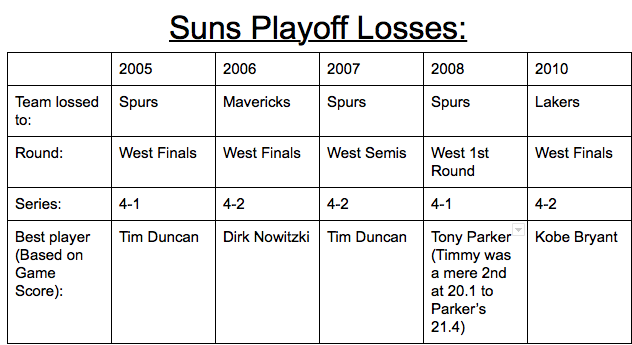 The mid-late-2000s Suns teams that I grew up with, and that (kinda) got me into basketball, never made the Finals. Their legacy is credited to their innovation, and I consider it a NBA tragedy that they never won. The reason they never won the Finals? The chart above explains, and the reason is part of the point of this column. Tim Duncan and Kobe Bryant destroyed my childhood. They beat us practically every year. So while I have the utmost respect for Duncan (Sorry Kobe! ), those guys hold a dark place in my heart. The problem is that you can’t hate Duncan. Even if you truly do in your heart (Which I don’t. Kobe maybe), its not something you can admit. You’ll get killed for it. Thats why I have so much respect for Duncan. He was too hard to hate, even though he beat us three times growing up. I think one of the things we’ll remember the most about Duncan the player was how polished he was. It showed up when you watched him and in his stats. No one moved better, rebounded better, or kissed one of the glass better. The guy was so polished, so smooth with the ball. There’s many things we can applaud Duncan for, but the underrated aspect will be him retiring at the right time. Not many guys have done that. Duncan did. Like so many other things in his career, he did it. He did it and didn’t complain. Did it and got it done. Thats the Tim Duncan I’ll remember.